Details relating to the Slovenian Commemorative of 2008. This coin commemorates the 500th birth year of Primoz Trubar. Primoz Trubar was a champion of the reformation and an active preacher. The counter reformation led him to flee to Germany where he worked as a minister in the Lutheran church from 1653 to 1561. He translated the bible into the Slovenian language and is regarded as the founder of Slovenian literature. The effigy of Primoz Trubar dominates in the inner circle. Around the edge of the inner circle his name plus the issuing country and the year of issue appears. Also shown are his birth and death years 1508-1586. 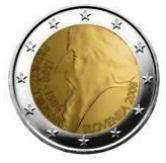 The standard Slovenian one euro coin is also dedicated to Primoz Trubar. 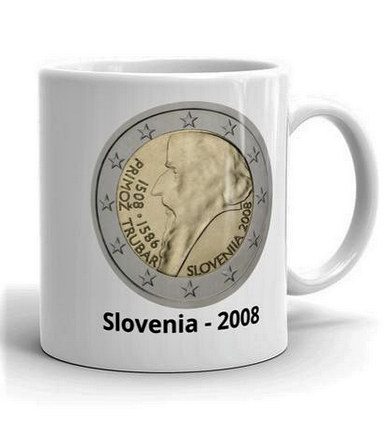 Return from Slovenian Commemorative 2008 to euro coin collector.